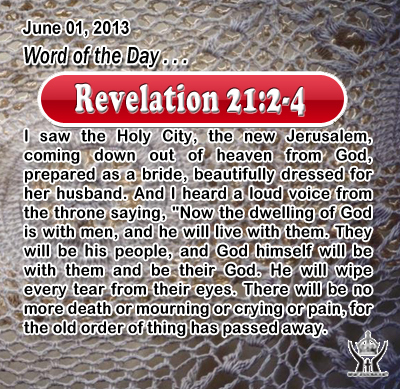 Revelation 21:2-4I saw the Holy City, the new Jerusalem, coming down out of heaven from God, prepared as a bride, beautifully dressed for her husband. And I heard a loud voice from the throne saying, "Now the dwelling of God is with men, and he will live with them. They will be his people, and God himself will be with them and be their God. He will wipe every tear from their eyes. There will be no more death or mourning or crying or pain, for the old order of thing has passed away. Heavenly Father, please help us as we try continue serving you faithfully. Our desire is to be steadfast in our love and living for you until the glorious day that so many of your children have longed for over the centuries. We long to see you in your glory and to share in your presence and to join with the saints of all ages praising you around your glorious throne. Through Infant Jesus we pray. Amen. 27And they came again to Jerusalem. And as he was walking in the temple, the chief priests and the scribes and the elders came to him, 28and they said to him, "By what authority are you doing these things, or who gave you this authority to do them?" 29 Jesus said to them, "I will ask you a question; answer me, and I will tell you by what authority I do these things. 30 Was the baptism of John from heaven or from men? Answer me." 31 And they argued with one another, "If we say, `From heaven,' he will say, `Why then did you not believe him?' 32 But shall we say, `From men'?" -- they were afraid of the people, for all held that John was a real prophet. 33 So they answered Jesus, "We do not know." And Jesus said to them, "Neither will I tell you by what authority I do these things. Many religious leaders took offense at Jesus because they could not accept his power. After Jesus had radically cleansed the temple of the traders and money-changers the Jewish leaders question Jesus to catch him. If he says his authority is divine they will accused him with blasphemy. If he has done this on his own power they might well arrest him as a mad supporter before he could do more damage. Jesus, seeing through their trap, poses a question to them and makes their answer a state for his answer. Did they accept the work of John the Baptist as heavenly or human? If they accepted John’s work as heavenly, they would be compelled to accept Jesus as the Messiah. They moved the question because they were disinclined to face the truth. They did not accept the Baptist and they would not accept Jesus as their Messiah. Loving Infant Jesus, your word is life and truth. Instruct our heart that we may grow in the knowledge of your truth and live according to your word.